Thanks for sticking with me during my infrequent posts. Only one more week of LSATs and then I'll be all yours again! Today's post features one of my favorite layering combinations EVER. As you know, I love blurple. And with this blue glitter? Forget it. 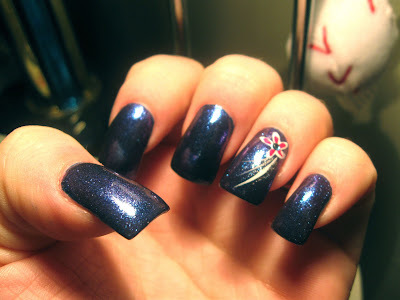 This is OPI DS Fantasy, a deep blue glitter with multichrome glitter. And as you can see below (credit: lunatikitty.blogspot.com), it's a really pretty color. But it's missing a wow factor for me. Same goes for OPI DS Royal (credit: all-you-desire.com), which takes numerous coats to build up and isn't a duochrome either. Amazing. A beautiful grape color with vivid royal blue shimmer that blows most other purple glitters out of the water. Now, it's still not a duochrome, but it has much more of a wow factor than Fantasy or Royal on their own. If you've got both of these lovelies, then I say... what are you waiting for? Happy layering!